The Community College Initiative Program is designed to support Pakistani young professionals at accredited U.S. community colleges for one year of non-degree study. Programs are being offered in the following fields: Agriculture, Applied Engineering, Business Management and Administration, Media, Tourism and Hospitality Management, Public Safety (Rescue/Disaster Management Services) and Early Childhood Education. The applicants must be resident in Pakistan, currently employed in one of the fields listed above, have 14-15 years of education (2-year Bachelors), English language proficiency, potential to have a positive impact on Pakistan's future development and demonstrated leadership. Participants spend one academic year in the United States and earn certificates in their fields of study. After completing the program, participants return home with new skills and expertise to help them contribute to the economic growth and development of Pakistan. Complete application package, including academic transcripts and three letters of references must be submitted to USEFP at P.O. Box No. 1128. For whom is this program intended? 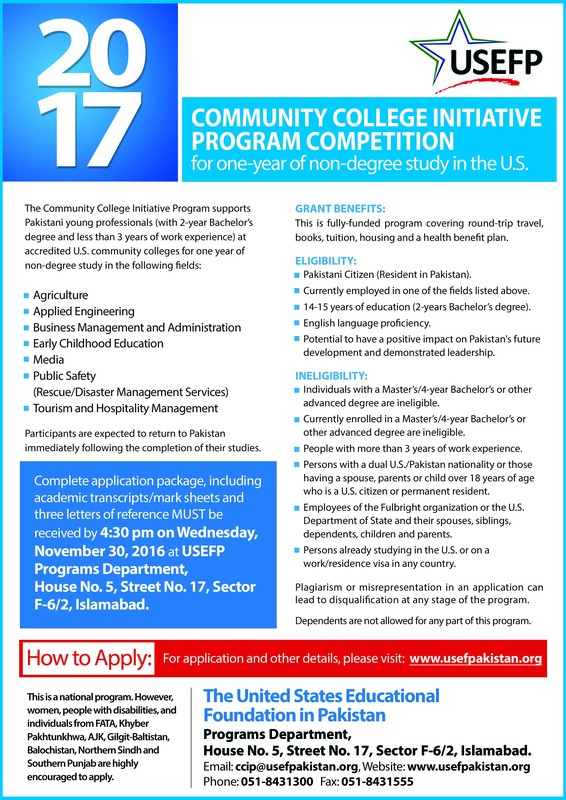 The Community College Initiative Program (CCIP) is designed to enable young professionals from Pakistan(with 2 year Bachelor's degree and less than 3 years of work experience) to spend one year studying at community colleges in the United States, earning a vocational certificate in the process, while immersing themselves in U.S. cultural life. The promise of this program is its value in modeling for Pakistanis the U.S. system of flexible and blended education for lifelong learning. The program engages promising non-elite students who by virtue of disadvantages or interest may not qualify or be appropriate for a four year Bachelor's/Master's degree program- and who, through the exchange, will receive a technical certification that may be useful in Pakistan's developing economy or perhaps develop an interest continuing for a regular degree program in Pakistan. What is included in the CCI program grant? The grant funds tuition, textbooks, airfare, a living stipend, accommodation and health insurance. If I'm selected when will I begin studies in the US? After their selection has been finalized applicants will be required to take the Institutional TOEFL (ITP). A minimum of 400 score (out of 677) will be required to qualify. I have done a two year bachelor's degree am I eligible? Yes, as long as you are currently working in the eligible fields listed above. I have done a two year bachelor's degree but I am currently not employed, can I still apply? No, you need to be currently working in one of the relevant fields to be eligible for the CCI program. I have completed a four years Bachelors degree and I am working in one of the eligible fields, can I apply for this program? No, persons with a four years Bachelors degree are ineligible to apply for this program. I have completed a three year Bachelors degree and I am working in one of the eligible fields, can I apply for this program? Yes, you can apply as far as you are working in one of the specified fields. I have completed my Masters degree and I am working in one of the eligible fields, can I apply for this program? I have completed my Bachelor's degree and currently I am enrolled into a Master's program, can I apply for this program? No, current students are ineligible to apply for this program. I understand that I must submit three letters of reference. Whom should I ask to write such a letter? Consider asking teachers, advisors, or other professionals who are familiar with you and your work. Since you are currently working, ask your supervisor or other professional. Family members or other relatives are not eligible to write letters of reference. PLEASE DO NOT WRITE THE REFERENCE LETTER YOURSELF AND JUST ASK YOUR REFEREE TO SIGN IT. It is usually obvious when this has been done and it reduces the value of the reference. Should referees send our reference letters directly to USEFP, or can they be sent with our application form? Reference letters should be sent directly to USEFP by your referees in sealed envelopes. It is important that your referees should clearly mention the name of the program the applicant is applying for and the applicant's name. How will I know that my application was received? The USEFP Office will notify you of receipt of your application by email. This may take some time as there are many applications to process. Please do not phone or email to check. Should I send my original documents with my application form? Round 1: All applications will be screened by USEFP staff for completeness and minimum qualifications. Round 2: Complete applications that meet the minimum qualifications will be evaluated according to a set of established criteria and short listed. Round 3: In-person interviews of short-listed applicants will tentatively take place at Islamabad and Karachi in the month of January 2017. The interview panels are made up of both U.S. and Pakistani citizens. Round 4: Final nominations will be made in February, 2017. Applicants who have been nominated will be notified by telephone. Those who have not will be notified by mail. Final approval is given by the higher authorities in the U.S.
Will I need to submit any additional documents if I become a finalist? Yes, finalists will be required to submit copy of the data page of valid passport and a completed Medical History and Examination Form. Can I defer my grant to the following academic year? No, you cannot defer. You can, however, decline the grant and reapply at a later date. Will I have to get admission to a university on my own? No, our partners in the U.S. will find an appropriate placement for you.